The Edward House House (c. 1894) is significant as an example of balloon-frame Free Classic Queen Anne residential architecture. The Queen Anne style became the dominant residential style in America from 1880 until 1910. Known for its asymmetry and rich surface textures, the style provided an opportunity for both high-style designers and vernacular builders to incorporate some or all elements of the Queen Anne in residential architecture. Queen Anne features on this house include a steep hipped roof with lower cross gables, tall narrow windows, and decorative eave brackets. East side of 800 block of Arkansas St. and West side of 800 Block of Missouri St. The Johnson Block Historic District is a residential district in Lawrence located eleven blocks east of downtown and three blocks north of the University of Kansas. 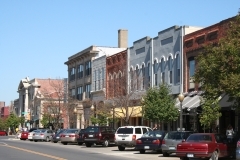 The district encompasses the east side of the 800 block of Arkansas and the west side of the 800 block of Missouri, including an alley between the two streets. It is a mix of residential property types outlined in Section F of the Multiple Property Document Form “Historic Resources of Lawrence, Douglas County, Kansas.” The residences were built during the “A Quiet University Town, 1900-1945” period described in the MPDF. Located in Lane Place Addition, the residential development initiated by Victor Johnson, a prominent Lawrence businessman, is an example of the southern and western expansion of Lawrence. Walter and Fannie Kibbee developed a small 15-acre farmstead on the outskirts of Lawrence in the early 20th century. They raised small numbers of cattle, milk cows, poultry, and swine, produced butter and eggs for sale, and farmed a few acres in alfalfa and other crops. They sold the farm in 1920 to Conrad and Bertha Altenbernd, who farmed the property until 1947. 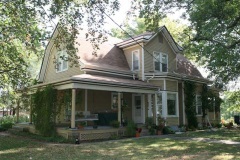 The property was annexed by the City of Lawrence in 1959. Today, the collection of six farm buildings is now within the city limits amongst mid-20th century development. The buildings include a Dutch Colonial Revival-style residence, gable-roof barn, chicken house, outhouse, garage, and shed. The farmstead displays an abundant use of concrete, a popular building material on Kansas farmsteads in the 1910s. 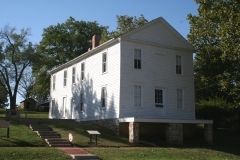 It was nominated as part of the Agriculture-Related Resources of Kansas multiple property nomination for its local significance in the areas of agriculture and architecture. 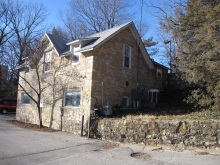 The Lane-Duncan stable is built into the eastern slope of a steep hill located along the northern edge of the campus of the University of Kansas. It is oriented to the east and once had a commanding view of downtown Lawrence and the Kansas River valley, but trees and twentieth-century development have obscured that view. Despite exhaustive research of the historical record, much of this building's early history remains unknown. What is known about this building is that its vernacular Gothic Revival limestone architecture is reflective of the settlement period and that it is a rare surviving example of a stone outbuilding within the current city limits of Lawrence. It is located on south half of James H. Lane's original landholdings. 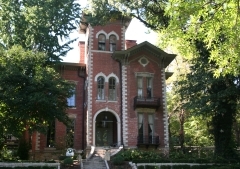 Lane, who likely commissioned the construction of the building, was an important political figure in the early history of Lawrence and Kansas, and this property could yield information about his property holdings. Additionally, the property's subsequent owner, Wesley Duncan, comes from another locally prominent family, and further study of the building could yield information about his use of the structure. In the case of both men, this is the earliest extant resource left on their landholdings. The building was nominated for its architecture and potential to yield information important in history. 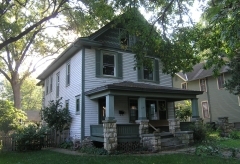 The Greenlees House, located near the historic Old West Lawrence neighborhood, represents five building phases spanning nearly 50 years. 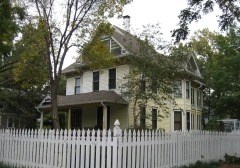 Early Kansas Senator James Lane built the first phase of this house in circa 1863 and sold it to newspaper publisher Charles Faris in 1865 whose family made a small addition and occupied the house until 1880. John Greenlees purchased the house in 1893 and lived there until his death in 1947. Greenlees made his fortune in real estate and developing and managing oil interests, and founded the Mutual Oil Company in 1909. Between 1899 and 1911, Greenlees doubled the size of the house by expanding it west and north. He consolidated the house stylistically into an updated and coherent, early 20th century residence with a new comprehensive roof system, large cross gables, and a large front porch with Classical Revival pillars. The resulting appearance resembled a large four-over-four house type. The property was nominated for its associations with entrepreneur John Greenlees. generally along Massachusetts St., bet. 6th Ave. and S. Park St.
George Mackie commissioned this impressive Neoclassical Revival-style residence in 1917. It is located on a large corner lot south of downtown Lawrence on Massachusetts Street. Mackie’s family first settled in Cherokee County in 1883 when he was just 15 years old. He grew up around the coal-mining industry, and in 1906, he organized the George K. Mackie Fuel Company. The Mackie-Clemens Coal Company is still in business in Crawford County. In 1937, Mackie's widow sold the house to the Lawrence Women's Club, which used it as a place for social gatherings and meetings until 1975. 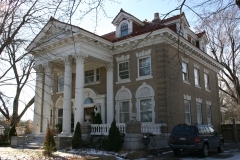 The house, designed by H. Alexander Drake of Kansas City, is a textbook example of the Neoclassical Revival style and includes such features as a monumental portico, side wing porch, roofline and front porch balustrades, and heavy window and door surrounds. 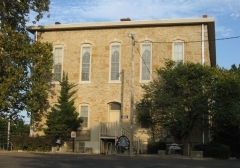 It was nominated as part of the "Historic Resources of Lawrence" multiple property lubmission for its architectural significance.